A friend suggested we go to Fonda for brunch. I knew nothing about this place, so with no expectations, I entered! A Mexican eatery serving a really refreshing menu. The brunch entrees had the typical ‘breakfast burrito’ and the like but everything seemed to be with a little extra je ne sais quoi and a few new surprises. I chose the Huevos Divorciados, which quite literally means divorced eggs. The description was breathtaking. 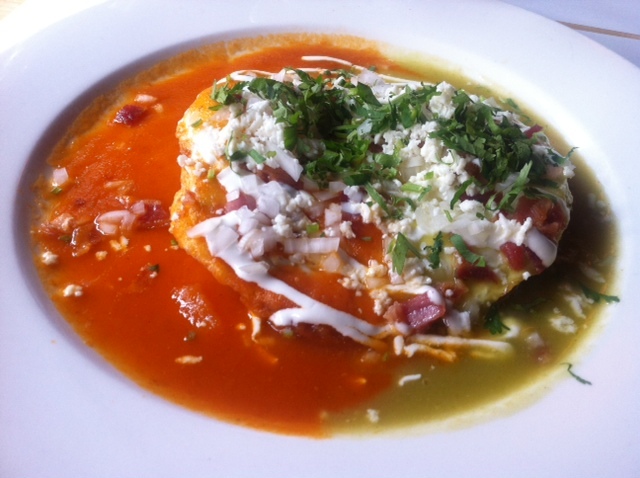 Two sunny side up eggs separated by two sauces, salsa verde and ranchera sauce, served with black beans, crispy bacon, queso fresco and crema. The taste, even better. The eggs and all the accoutrements are inside a crispy pocket of tortilla, how they manage to not break the yolk, I have no idea. Cutting open this culinary feast to see the yolk ooze out into the salsa looked so beautiful. The oranges, reds and green were good enough to eat, it was quite unbelievable! Perfectly cooked and light enough to not feel bloated and overstuffed, this place really gets it right. There was a really nice atmosphere and the service was good…minor pet hate was that they cleared some dishes before others had finished. Also, eyeing up what others had…next time I am definitely ordering the guacamole! Go and check out this East Side gem.